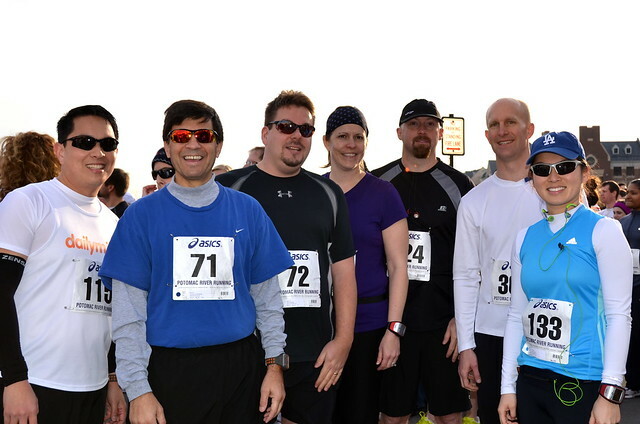 To finish out the year, I ran a 10k race with my DailyMile friends. The event is a charity event http://www.ringinginhope.com/ that allows participants to choose one of the race's charities. I chose to support Loudoun's Habitat for Humanity. I didn't run the day before, and had not done any training explicitly for this race. 10 kilometers (6.213 miles) is a distance I can easily conquer, but don't usually run with a strategy to run this distance at maximal speed. I just jog along at 5 miles per hour until I'm done. For a race this small, running a 12 minute mile would have me come in dead last with a 10k time of 1 hour 14 minutes. My personal record for a 10k race was 1 hour 6 minutes, 47 seconds, with my Run 2 Register 10k in March 2010. With all the running I've done since then, I was surely in better shape, but with the recent speed of my runs and the lack of targeted training for this, getting a better race time was not a sure thing. In case you are mistaking me for a competitor, I'm not. I like to think I enjoy running on the back-end of the pack. I don't have any grand visions of me winning any races like this, or even coming in the top half of my age group. The only competitor I have is myself -- to beat that time I made 9 months prior. I started the race by bringing along my cheering crew, Joey, Joshie, Cecilia and Stacy forced me to leave with a later departure time than I was originally planning, but their company was quite welcome. I met up with my DailyMile friends, with whom I've been sharing running stories for the past 9 months. I've met with Stu a few times before, for long runs along the W&OD. I first met Stu at my first 10K race in March. The start line was crowded, but started thinning out quickly. The race was self-seeding, where those who thought of themselves as fast would get at the front of the line, and we slow-pokes would bring up the rear. I seeded myself in the middle, mostly because that's where my friends were standing as the race was getting started. The start of the race was pretty crowded, and just like the last 10k I ran, lots of people passed me. My marathon strategy of "start off slow, then back it off" was really not appropriate for this race. It was more like "start off too fast, then try to keep it up the whole way around." My first mile split was an unbelievable 9:39 pace (which I would never run on my own!). The following miles, I backed off to a more respectable pace in the low or mid 10's. Because of my late arrival, I didn't drink enough water, and in an effort to minimize the amount of weight I was carrying, I didn't bring along any water bottles or my camel back. By mile 2, I was terribly thirsty. I didn't review the course map or water stations before the race, so I wasn't even sure if there was going to be water on the course or not. I welcomed the water station at the halfway point, where I walked through the water station, quickly downing four paper-cups of water. I got back out after the water station, and picked up my unreasonable pace. Most of the crowd had already left me behind, and the people for the last half of the race that were going to finish with me were running my speed. My heart rate was high the whole race through, but I still had a little left for the final push. As I passed mile 6, the final part of the course was uphill. I slowed a bit to get up the hill, but still had some speed left in me. As I crested the final hill, my friend Stu was waiting for me at the top, cheering me on to finish strong. I ran as fast as I could get myself to move, and sprinted as fast as 12 mph for the last 0.1 miles. 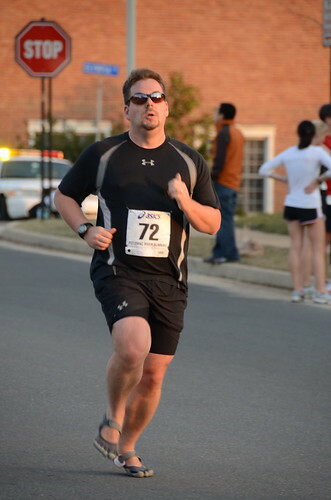 My friend Ray took some excellent photographs of me sprinting to the finish line. My final time was definitely a personal record, beating my previous 10k time by almost 2 minutes. The chip time was 1 hour 4 minutes and 48 seconds. I had an electronic chip attached to my left shoe that recorded when I passed the starting plate and when I crossed the finish plates. This was a more accurate account of the time on course than my GPS, since I didn't start or stop the watch at either of the crossing points. My official standing was 50 out of 56 (eek! ), but like I said before, I don't mind that much, since I am not an Olympic running athlete. I suppose technically, I'm still a novice runner. Don't think of me as fast, just persistent. The winner of this race was also a 38 year old from South Riding, but to put his speed into perspective, he was running an average rate (5 minute 15 seconds per mile) faster than my fastest possible sprint speed that I showed at the finish line. Running with friends is the best part about all of this. I am especially thankful to my friend Ray Javier, who took all of those great photos of me at the finish line. Stacy had brought along the camera, but there weren't as many pictures along the last few yards of the run as what Ray managed to get. Most of the runners you see in the picture above will be running with me at the Ragnar Relay in September, a 196 mile run from Cumberland Gap to Woodrow Wilson Bridge in Maryland, split up among 12 runners.